The key to stretching your food dollars is planning and awareness. Taking the time to plan your family’s meals, budget your food dollars, and write out a grocery list can save your family money on the grocery bill. The following tips are things you should think about before making that trip to the supermarket. Remember, changing habits is hard! Try one or two of these tips during each supermarket trip. Soon you’ll see some relief in your grocery bills. 1. Plan your menus. Remember to consider what you have on hand, your family’s food preferences, your time schedule and MyPyramid when planning meals. 2. Keep a grocery list. Creating a grocery list saves you time and money at the supermarket. Keep your grocery list where it’s easily accessible, such as on the refrigerator, this will help you to keep an on-going list of items as your supply becomes low. Remember to stick to your list. 3. Know the regular pricing of items you normally purchase. Keeping tabs on pricing of common items you purchase can save you money by recognizing savings or price increases. 4. Be alert for unadvertised specials in the store. 5. Be aware of supermarket advertising gimmicks. For example buy one get one free deals. Pay close attention to price of the items, this deal usually includes a price increase for one item to compensate for the free item. 6. Compare prices of different sizes and brands of the foods you’re buying. Find the best priced item by comparing the unit prices. Unit pricing is located on the shelf tag. The shelf tag shows the total price (item price) and price per unit (unit price) for the food item. 7. Ask for rain checks. If a specially priced item is sold out, ask for a rain check. It allows you to purchase the item at the sale price at a later date. 9. Buy the store brands. 10. Shop in season. Fresh produce tastes better and costs less when it’s in season. 11. Avoid convenience foods. The cost is higher for individually packaged items, such as 100 calorie packs. Cut cost by buying in bulk and making individual packets using plastic snack or sandwiches bags. 12. Invest in staple foods when the price is right. Foods such as canned goods can last an extended period of time on the shelf; so, stock-up when the price is right. 13. At checkout do a quick inventory of your cart. Remove any impulse items, such as magazines or candy bars. 14. Check receipt for correct prices. 15. Do not shop when hungry! Shopping when hungry encourages impulse buying of foods that are not on your grocery list. USDA Rural Development is taking loan guarantee and grant applications for the Rural Energy for America Program, or REAP, for projects to be awarded in 2010. USDA Rural Development's Renewable Energy for America Program (REAP) offers grants, guaranteed loans, and combination grant/guaranteed loans to help agricultural producers and rural small businesses purchase and install renewable energy systems and make energy efficiency improvements. In 2009, producers and businesses in Louisiana received $308,273 in REAP grants for renewable energy systems, energy efficiency improvements, feasibility studies, and energy audits. Businesses and producers in rural Louisiana looking to create renewable energy or make energy-saving improvements may be able to finance up to 75 percent of eligible project costs through the program. Stand-alone grants can be awarded up to 25 percent of total eligible costs. To qualify for financial assistance through REAP, project costs must be greater than $6,000 for energy efficiency projects and $10,000 for renewable energy projects. Details are available online at: http://www.rurdev.usda.gov/la/REAPinfo.htm or by contacting the Renewable Energy Coordinator Kevin Boone at (337) 262-6601 extension 133. USDA Rural Development provides a full range of rural development credit services in rural Louisiana. Area Offices are located in Monroe, Natchitoches, Lafayette, and Amite; and the State Office is located in Alexandria. For more information on USDA Rural Development's loan and grant programs, visit http://www.rurdev.usda.gov/la. Since the inception of the SU Ag Center’s Communities of Color Network in 2003, Louisiana has seen a significant decrease in the prevalence of tobacco use among African Americans. According to Tonia Moore, grants and contract coordinator with Louisiana Public Health Institute, Louisiana has witnessed a large volume of African-American callers to the Louisiana Quit Line in the last four years (approximately 31-37% of the callers are African Americans). “This speaks volumes to the number of Louisianans who are ready to kick the habit and improve their overall health,” said Moore. Although the numbers continue to decrease, African Americans in Louisiana are twice as likely as other races to die from tobacco-related illnesses such as cancer and cardiovascular diseases. According to data from the 2007-2008 Adult Tobacco Survey, African-American nonsmokers are more likely to be exposed to secondhand smoke at work than white non-smokers. African-American smokers are less likely to have smoke-free homes than white smokers. According to the 2009 Louisiana Youth Tobacco Survey, 49% of African-American middle school smokers usually smoke menthol cigarettes and 64% of African-American high school smokers usually smoke menthol cigarettes. African-American youth are much more likely to smoke Black & Mild cigars than white youth. “The data reflects the need to build awareness and implement community and organizational policies among African-American communities,” said Moore. This is a joint project of five institutions: LSU Ag Center, SU Ag Center, Angelo State University, Fort Valley State University, and Tuskegee University. The lead institution is LSU Ag Center. The SU Ag Center research team members are: researchers Fatemeh Malekian and Sebhatu Gebrelul, and research associate Janet Gager. This project will identify production practices and product traits at each segment of the meat goat industry that will increase the net economic benefits and productivity of meat goat producers. The meat goat industry is the most rapidly growing livestock category in the U.S., but is highly unstructured compared to other livestock industries. Specific information is needed about each segment so that potential common market and product linkages can be identified and relative product values in each segment can be distinguished. The research will determine purchase and consumption patterns for goat meat through a national survey of consumers; to evaluate live, carcass, and meat traits of kid and yearling goats representative of meat goats being marketed in the U.S.; and to survey producers on production and marketing practices needed to increase net margins and productivity within the next five years. This information will allow cohesion in communication and linking of product valuation among the production, processing, and retail market sectors. The multistate investigation will integrate research and outreach activities by using extension personnel to identify producers to answer additional questions about production and marketing after initial producer and consumer survey queries and analyses of animal and product characteristics have been conducted. Not everyone has a gym membership; therefore winter weather can make it difficult to participate in outside activities. If your workout plan includes outside activities such as walking, jogging, swimming, or biking don’t let the cold weather break your routine. Avoid inactivity during the cold season. Develop a workout plan specifically for the cold season and avoid making excuses for not exercising. When planning your winter exercise plan think of all the benefits you will enjoy from exercising on a regular basis. First, think about the goal you will like to set for yourself when thinking of your cold season exercise plan. We set goals for ourselves to provide us a finish line to work towards. Whether your goals are to lose weight or to improve your blood pressure, remember to be realistic. Setting unrealistic goals such as a 20 pound weight loss in a short period of time sets us up for failure. Start off slow and work your way up to the larger goals. The next task is to determine what physical activity you can and will enjoy doing during the winter season. You should also consider available blocks of time you have for accomplishing physical activity when choosing an exercise routine. Some great indoor exercise activities that can keep your routine going are dancing, Pilates, yoga, jump roping, or mall walking. To relieve boredom try choosing 3-4 activities for you to do on different days of the week. Invest in some dumbbells and a stash of fitness DVDs to create a at home gym. If time is an issue try bringing your athletic shoes to work and taking a short brisk walk on your lunch break. If space allows team up with your co-workers and do a short aerobic DVD during your breaks. You can also exercise throughout the day. Try exercising for 15 minute intervals at least 2-4 times throughout the day. And do not count out the family. Build your exercise routine around family time. Exercise as a family, this allows you to spend time with your family while becoming physically fit and showing your children model behavior. Remember, some physical activity is better than none. Some other tips to remember while planning and achieving your winter exercise routine are to maintain hydration and purchase the appropriate exercise wear for the season. It’s easy to remember to drink fluids when it’s hot outside. However, in the middle of winter, you might forget. Proper hydration means drinking fluids before you feel thirsty. A minimum of 64 ounces of water or water-based beverage per day is a good start. Any amount of physical activity increases your hydration needs. Also, sport drinks can provide hydration, but be aware of the extra calories. Choose some of the low calorie options available. Beware of “designer water!” These products promise hydration and 100% intake of a variety of vitamins and mineral, but are usually full of sugar. Stick to consuming vitamins and minerals the old fashion way, by eating a healthy diet with a variety of foods. If you do choose to conduct physical activity outside during the winter season dress properly. Long sleeve shirts, gloves, hats, pants, and thicker socks can help you avoid feeling cold or experiencing dry skin or wind burns to your skin. Aim for at least 150 minutes (2 hours and 30 minutes) of moderately intense physical activity per week. Participating in 150 minutes of moderately intense physical activity can result in an increase in health benefits caused by increased physical activity. A low level of physical activity can contribute to the onset of chronic diseases, thus decreasing your quality of life. Being physically active during the winter season can be simple and enjoyable with a well thought out plan that is best for you. Most importantly enjoy the benefits of maintaining your exercise routine such as keeping off the winter weight. In order to teach local communities, families, school leaders and childcare center employees how to respond to emergencies, the SU Ag Center Family and Human Development program hosted a three-day emergency preparedness training for Extension agents who work through-out the state. “It makes no difference what the disaster is, but it does matter that all of us learn to mitigate and pre-pare in order to remain safe and healthy,” said Chancellor Leodrey Williams. 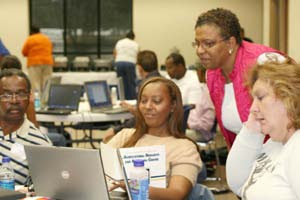 As a result of hurricanes Katrina, Rita and Gustav, the Southern University Agricultural Research and Extension Center collaborated with the Department of Health and Hospitals and the Center of Emergency Preparedness to reduce the hardship and struggle caused by disas-ters along with the poten-tial spread of the H1N1 threat faced by citizens of this state and others nationally. “The last decade has brought to the forefront horrendous weather condi-tions that have prompted many families and other individuals to learn emer-gency responses to various hazards,” said Kasundra Cyrus, Ed.D, Family and Human Development Specialist, and training organ-izer. These conditions have included natural, man-made and technological conditions in addition to the risk of pandemic type situations. Each agent received a cur-riculum resource guide to teach citizens how to make advanced preparation for their communities’ different needs and various dis-asters. According to Cyrus, provisions are made for the resource curriculum guide to offer directions for com-munity-centered trainings, but each agent or educator should have a knowledge base and a set of skills in disaster preparedness and readiness. “It is our responsibility to assist the community and ensure that home environ-ments are safe and secure. To promote these safe environments, the curriculum guide focuses on the pre-ventive measures of disaster planning and emergency readiness,” said Cyrus. Although the training did not highlight every kind of disaster that can occur, it provided program partici-pants with an overview of hazards, knowledge, training, and skill building. Harper, statewide nurse consult-ant; Agricultural Emergency Preparedness by Diane Stacey, DVM, Louisiana Department of Agriculture and Forestry; Knowing What to Say about Emergency Preparedness and Mitigation by Ken Pastorick, public information officer; Chemical Spills and Other Hazards by Stephen Phillipe, Office of Public Health, Center for Emergency Preparedness; Emergency Preparedness Response Curriculum Guide and Program Evaluation, by Cyrus; What Should You Tell Farmers About Sheltering Livestock from the Disaster? by Renita Marshall, DVM, assistant professor, animal science, and di-rector of livestock programs, Christie Monroe, assistant live-stock program director, and Antoino Harris; Learning About Data and Data Entry by Wilbert Harris and William Augustine, Ag Center technology staff; Food and Water Safety During Disasters, De’Shoin York, assistant nutrition specialist, and Fatemeh Malekian, PhD, associate professor, Ag Center; What Should You Know about Crop Damage? by Chris Robichaux, PhD, county agent, SU Ag Center; Emergency Preparedness for Youth by Joanie Ledet, parent educator, SU Ag Center; Emergency Preparedness for Families by Delores Johnson, parent educator, and Sarah Sims, extension agent, Southern University Ag Center. The agents returned to their parishes prepared to provide classes that will enable citizens to prepare for and mitigate any emergency situation over time.